On May 13, 2014, a 57-year old priest from New Jersey fell from the summit ridge on Mt. Hood when a snow cornice that he was on collapsed. The priest died in the fall. His body came to rest on the north side of the mountain on the lower edge of a large crevasse about 400’ below and southwest of a feature known as the Queen’s Chair. The Hood River County Sheriff’s office requested Portland Mountain Rescue to assist the Crag Rats in recovering the body. The Crag Rats planned and lead the mission. PMR provided technical support and personnel. 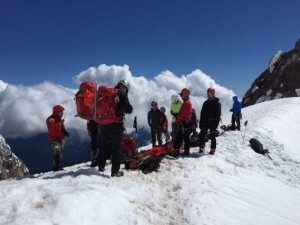 Around 1:00 a.m. on the morning of May 21, five PMR rescuers joined a team of Crag Rats at Timberline Lodge and boarded a snow cat that carried them to the top of the Palmer ski lift. From there, the team climbed to the summit and descended Cathedral Ridge to the Queen’s Chair, which they reached around 6:00 a.m. 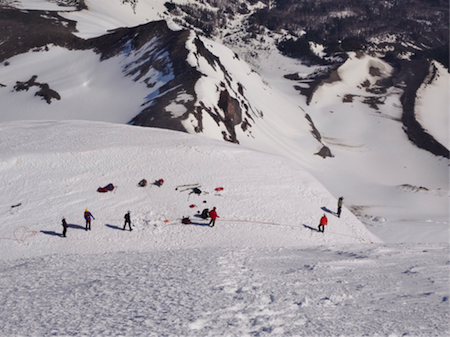 The team assessed snow and rock stability and risks, and then two rescuers descended to the body. These rescuers packaged the body for transport. At the Queen’s Chair, rescuers built a haul system with ropes and pulleys anchored in to the snow. With this system, they maneuvered the body up and across the mountain face so that it could be lowered down the Sunshine climbing route to a large snow field known as the Snow Dome. 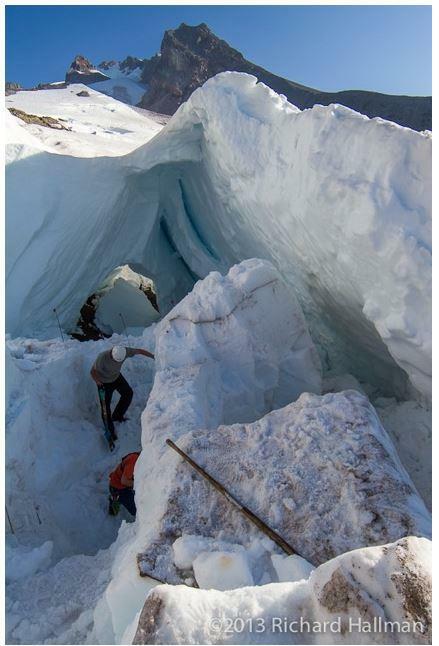 They encountered several impediments to moving the body through the steep and crevassed area and did not get the body to the Snow Dome until around 2:00 p.m.
A team of Crag Rats met the body on the Snow Dome and carried it on a toboggan to Bagger’s Point. From there it was transported off the mountain by helicopter. We offer our condolences to the victim’s family and friends. We urge climbers to remember that the upper portion of Mt. Hood poses many dangers, one of which is unstable snow and rock along the north side of the summit ridge. In this area, climbers should stay off any snow that they are not sure is resting firmly on stable rock. At approximately 2:15 p.m. on August 23, 2013, the Multnomah County Sheriff’s Office requested Portland Mountain Rescue to recover the body of deceased hiker near Multnomah Falls. The hiker apparently had fallen from a location near the Larch Mountain Trail (Trail #441) down a steep slope near Ecola Falls on Multnomah Creek (approximately 1/2 mile south of Multnomah Falls). By 4:00 p.m., the first team of PMR rescuers arrived at base. They reached the scene around 5:00 p.m. and developed a plan for raising the body from the creek back to the trail. A larger team of PMR rescuers then hauled a litter, ropes and other technical gear to the area. The rescuers first moved the body a short distance downstream to a better location. There they set up a rope system and raised the body to the trail. At the trail, they attached a single large wheel to the litter and transported the body back to the Multnomah Falls trail-head. All rescuers were out of the field by 8:15 p.m.
We offer our condolences to the victim’s family and friends. This mission is sad reminder that terrain in the Columbia Gorge poses significant dangers, especially when hikers venture even a short distance off trail. On August 11, 2013, Sebastian Kinasiewicz of Poland attempted to climb Mt. Hood by the Cooper Spur route. Mr. Kinasiewicz was a Polish soldier participating in drone training at InSitu in Bingen, Washington. According to media accounts, Mr. Kinasiewicz had hoped to place a Polish flag on the summit of Mt. Hood. He was reported to be a novice climber. Mr. Kinasiewicz was reported missing Monday morning and his car was found at the Tilly Jane trailhead on the north side of Mt. Hood. Shortly after noon on August 12, the Hood River County Sheriff’s Office requested Portland Mountain Rescue to assist the Crag Rats in searching for him. At that time, the sheriff was not aware that Mr. Kinasiewicz intended to climb the mountain or by what route. 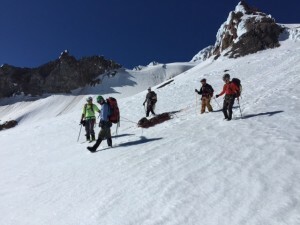 Before PMR members actually entered the field to search, the sheriff’s office obtained new information and determined that the searching would resume the following morning on the Cooper Spur route and the Elliot Glacier. Early on August 13, a Crag Rat team headed up the Cooper Spur Route. 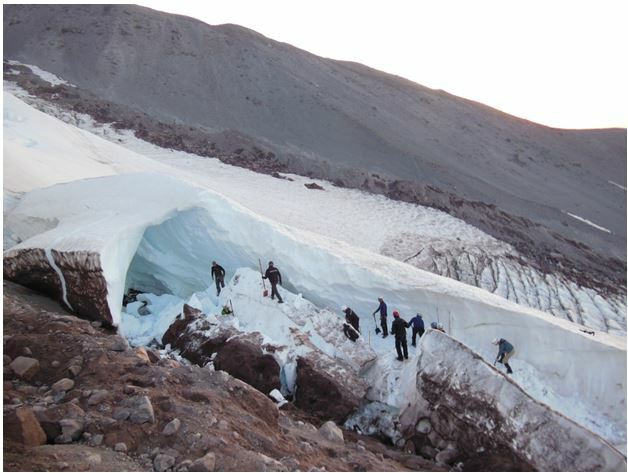 A PMR team ascended the east side of the Elliot Glacier in the fall line from the Cooper Spur Route. Witness reports were received of a lone climber on Cooper Spur on the afternoon of the 11th. The Crag Rat team followed a single set of tracks up the route. The tracks stopped abruptly on ice about 100’ from the summit. Shortly after that discovery, an Army National Guard helicopter arrived and began searching the area below the terminus of the tracks. They quickly spotted a body midway down the east gully on the mountain’s northern face. This gulley is long and steep and poses extreme rock fall hazard when it is not covered in ice or snow. Based on the extreme hazard posed by the location of the body, the sheriff’s office determined that the body could not be extracted safely by ground crews. The same conclusion was reached with respect to a helicopter extraction using the resources available. Recovery of the body may be possible during winter conditions. PMR extends its condolences to the Mr. Kinasiewicz’ family and friends and we are disappointed that we cannot immediately bring closure by recovering his body. We encourage back country travelers to know their route and know the conditions. The Cooper Spur route poses significant dangers and is not an appropriate route for a novice, especially a lone climber. Generally, the Cooper Spur route is not a safe choice once rock becomes exposed in late spring. Multiple fatalities and injuries have occurred on this route due to both falls and rock fall.